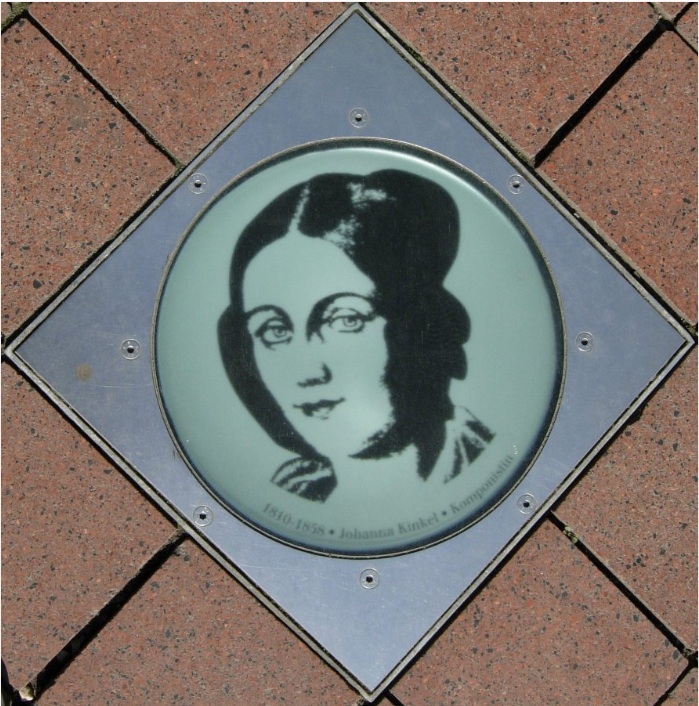 On the Walk of Fame (Bonngasse) in Bonn, is the faded star of Johanna Kinkel, trampled upon by thousands of pedestrians every day. Most of them know nothing about this brilliant musician of the 19th century, whose life unfortunately was not a song. Johanna was born on the 8th of July 1810 in Bonn, to a couple of average means. Being aware of her love for music, they arranged for her to study the piano under Franz Anton Reis, the man who tutored Beethoven. Even as a teenager, she was an accompanist to other musicians and also a coach to younger students. When Johanna married Johann Paul Mathieux a music bookseller from Cologne in 1832, little did she realise that her life would be a living hell through physical and emotional abuse. She left him six months later, but the trauma she had endured sent her into severe depression. Her divorce came through several years later. However, through the support of her friends, she recovered enough to resume her musical career. Her meeting with Mendelsohnn in1836 was a morale booster. He recognized her talent and encouraged her to concentrate on music. She then moved to Berlin and continued her musical studies under Karl Bohmer and William Taubert. To support herself, she gave music tuitions to students. As her musical prowess increased, she acquired a measure of popularity among musicians of her day and was welcomed into Literary circles. Her compositions were appreciated even by composers like Robert Schumann. In 1842, Johanna married a Protestant theologian, lecturer and poet called Gottfried Kinkel. Together they formed the ‘Maikäferbund’ – a group of poets. It was active from1840-1848 until the Revolution started. Gottfried dabbled in Politics. In 1848, during the revolutionary upheaval in Germany, he was imprisoned in Berlin and condemned to death for his political activities. But Johanna through her influential friends, had the sentence overturned to life imprisonment. However, Gottfried escaped from Spandau prison and sought asylum in London. By now Johanna had borne Gottfried four children. In 1851, she moved to London with them, to join her husband. The Kinkel residence became the centre of the expat German community in London. But Gottfried was totally immersed in Politics and had no time for his family. Johanna was the sole breadwinner but also had to cope with household duties and the care of her children. She not only taught music but became an author of merit on musical subjects.She was also a composer and director of a choir. Her reviews were regularly published in newspapers. 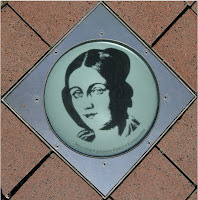 On the 8th of July 2012 which was Johanna’s 202nd birth anniversary, there were no celebrations in Bonn. Pedestrians rushed over her Star of Fame unaware on whose face they trod.